jb Capacitors manufactures Premium Metallized Polypropylene Film Capacitors – Axial type. 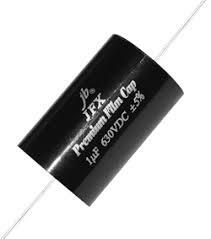 This high quality Premium Audio film capacitor provide perfect sound quality. jb Capacitors can sell low MOQ and competitive price. Following are Premium Metallized Polypropylene Film Capacitors features, specifications and drawing.